Ultra-concentrated pre-workout formula for professionals. The product has a strong anabolic effect and helps you get hard and inflated muscles during ćwiczeń.Najlepszy product on the market! 18 loyalty points Your cart will total 18 points that can be converted into a voucher of 0,72 PLN. TREC S.A.W. SHOT is an ultra-concentrated pre-workout formula for professionals. S.A.W. 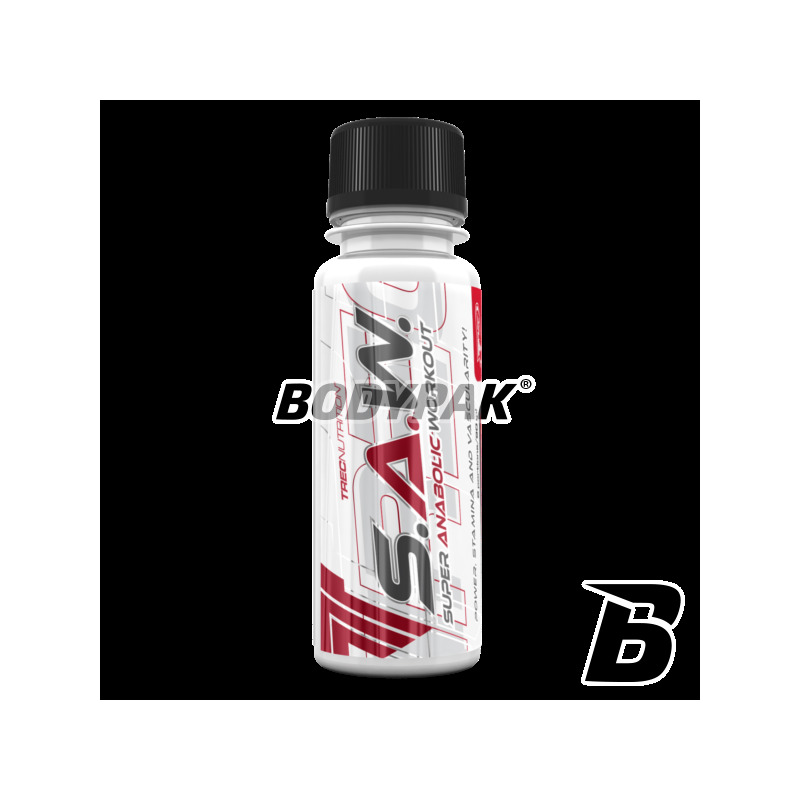 contains a unique complex of beta-alanine, caffeine, activators of nitric oxide and creatine. S.A.W. improves performance during consecutive short, very intense exercise. The beneficial effect is a consumption of 3 g of creatine per day. The unique complex of beta-alanine, caffeine production increases energy, improves concentration and increases motivation for training. The preparation may delay fatigue and counteract excessive acidification of tissues. S.A.W. It helps build muscle size and strength, and improves performance during strenuous exercise. If you are serious about the sport which you practice, you just think about supplementation. Professional training require the use of professional products! No matter whether you are a bodybuilder, a fighter, or strongman, your muscles need the same components to continuously generate power and energy! Only tested and safe substances will help you achieve success in every sports discipline. Do not experiment on your body using complicated and not always safe combinations of little-known and poorly studied ingredients. Leave experience of scientists! You are looking for a good pre-workout product? Check how many actually have active ingredients because they help you increase your exercise capacity! Do not pay for unnecessary fillers and "advanced" systems transporting creatine or amino acids, which in reality turn out to be an ordinary, simple sugar! Remember! The degree of concentration of the product and the correct choice of active ingredients and their respective dose and not the size of the package translate into a final effect of supplementation! You want your muscles are bigger and stronger, and the movements faster, stronger and more precise? Do you want to stand eye to eye with their weaknesses and maximize your body's inherent potential? Try S.A.W. - The strongest pre-training stack ever developed in the laboratories of TREC NUTRITION. Sharpen your senses! Feel the incredible surge of energy and open up a completely new experience training. From now on, your brain has absolute control over the work of the muscles! Move your exercise to the highest intensity level, which previously did not even think. Replace a regular workout on SUPER ANABOLIC WORKOUT! Drink 45-90 ml for 30 min. before the workout. You should not consume more than 90 ml per day! Avoid combining with other products containing caffeine! Shake well before using. Składniki: woda, SUPER Pump Vasodilators [alfa-ketoglutaran L-argininy, jabłczan cytruliny, jabłczan L-argininy, ViNitrox™: ekstrakty winogron (Vitis vinifera) i jabłek(Malus pumila)] 4622,22 mg/2080 mg; AGGRESSIVE Energy Maximizer [beta-alanina, N-acetyl L-tyrozyna, tauryna, ekstrakt grapefruita (Citrus paradisi) [98% naryngeniny]]3002,22 mg/1351,00 mg; WORKOUT Creatine Surge [jabłczan kreatyny] 2777,78 mg/1250,00 mg; aromat wiśniowy, aromat grejfrutowy, kofeina bezwodna 222,22 mg/100,00 mg; guma guar, guma ksantanowa, sorbinian potasu, benzoesan sodu, cyklaminian sodu, acesulfam K, sacharynian sodu, sukraloza, koszenila. Przedtreningówka która - poza cyklem kratynowym - działa na mnie zdecydowanie najlepiej. Idealna szczególnie dla osób poza cyklem na monohydracie chcą wzmocnić pompę i wydajność - w szczególności przy dniach rokujących na słabszą wydajność. Zdecydowanie polecam! Bardzo fajny skład. Odczuwalne pobudzenie pompa, oraz wzrost koncentracji na treningu. Na pierwszy raz polecam wziąć połowę ampułki, bo cała sprawia że aż za bardzo nas nosi. Nie zamienie tej przedtreningówki na żadną inną! Zawsze działa tak samo - bardzo dobrze pobudza, odpowiednio pompuje, zwiększa koncentracje i w dodatku dobrze smakuje - nic dodać, nic ująć!! Czy nie zażywając 3g kreatyny jak jest w opisie to zadziała tak samo? Advanced blend of active ingredients, so that your training will come to an even higher level. The formula was based only on legal and effective ingredients, in suitable doses! It contains no creatine - an ideal choice for breaks between cycles. The new GOLD standard pre-workout product! Strong, powerful pump and muscle mass! Select the most recent proposal for a reputable manufacturer and enjoy an unforgettable workouts! Trec S.A.W. - 120 kaps. Ultra-skoncentrowana formuła przedtreningowa dla profesjonalistów. Preparat wykazuje silne działanie anaboliczne i drastycznie zwiększa objętość pracujących mięśni. S.A.W. wspomaga budowanie siły i masy mięśni, a także poprawia wydolność podczas ciężkich wysiłków fizycznych. Comprehensive formula for use during training! It provides quick replenishment of electrolytes and hydration. It also protects against catabolism due to the content of BCAAs, intensifies anabolic processes and enhances the effect of pump training. A solid dose of caffeine but provides a quick boost of energy to work! Highest quality! Thoughtful composition and effective action! Sensational pre-training preparation in powder form (sachet), so that each workout will be made at 100%! Enhances muscle growth and development of physical strength. It contains only effective active ingredients, in suitable doses.